In another tragic case of white on white violent crime, on sunday afternoon May 17, 2015 several white supremacist motorcycle gangs got into a shot out. 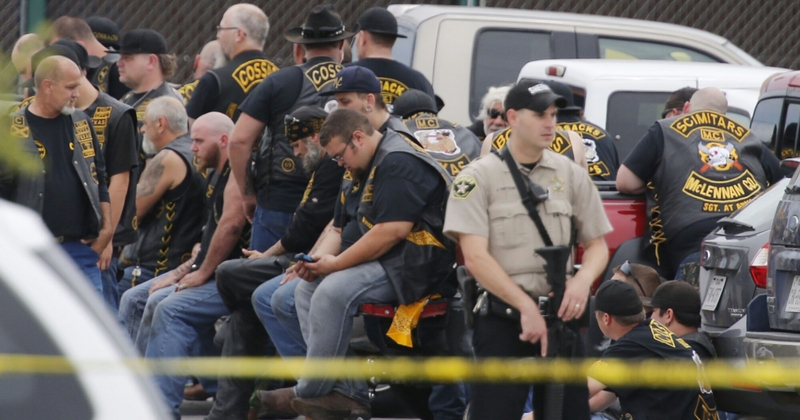 There were at least five gang factions involved and 9 people were murdered while 18 were injured as a result of the guns, chains, clubs and knives used in the Waco, Texas motorcycle gang melee. When police arrived they set up a command center to interview , arrest and process the biker thugs involved in the mini massacre. Fortunately for the murderous gang members, unlike the Baltimore and Ferguson protestors, who killed no one, the national guard was not called and Waco was not occupied like Iraq, even though there were over a 100 weapons recovered . Thugs thrugs thrugs thrugs come all USA, America , Texas Washington republicans , thrugs thrugs in Waco psych .